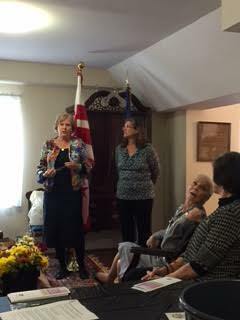 On Wednesday, November 12th, Freedom Petals had the opportunity to speak at the Daughters of the American Revolution luncheon chapter meeting. It was in conjunction with the chapter’s community service event to provide outreach and support to veterans of the Armed Forces Retirement Home. The DAR, founded in 1890 and headquartered in Washington, D.C., is a non-profit, non-political volunteer women's service organization dedicated to promoting patriotism. DAR members volunteer millions of service hours annually in their local communities; including supporting active duty military personnel and assisting veteran patients. We are proud to have been able to work with them to provide wonderful floral arrangements for our veterans. 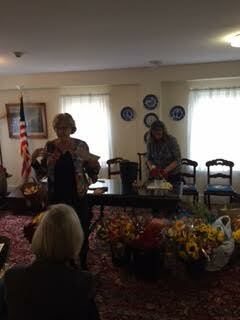 During the event, Freedom Petals’ Michele Bevington and Marilyn Myers, visited the DAR’s 1776 Chapter to share our experience in flower arranging. 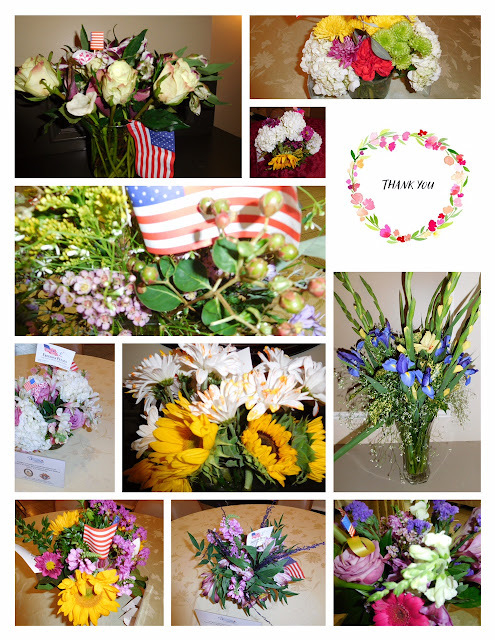 Following the demonstration the twenty DAR volunteers, using FP donated flowers and mugs, made over forty beautiful flower arrangements to be delivered to the Armed Forces Retirement Home here in Washington DC. It was truly a pleasure to have such a successful speaking engagement to share the mission of Freedom Petals Inc. and support their flower arranging event. It was so fulfilling because of the exceptional interaction with the DAR members and our ability to support our retired veterans at the same time. 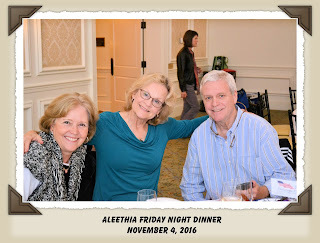 Thanks to you and all the wonderful volunteers of Freedom Petals who designed such beautiful floral arrangements for Aleethia’s Friday Night Dinner held on November 4, 2016 at the Washington Golf & Country Club. It made the dining room more welcoming and created a sharing atmosphere. It’s been said that the essence of flowers contain magical healing powers and that was quite evident by all the excited smiles. 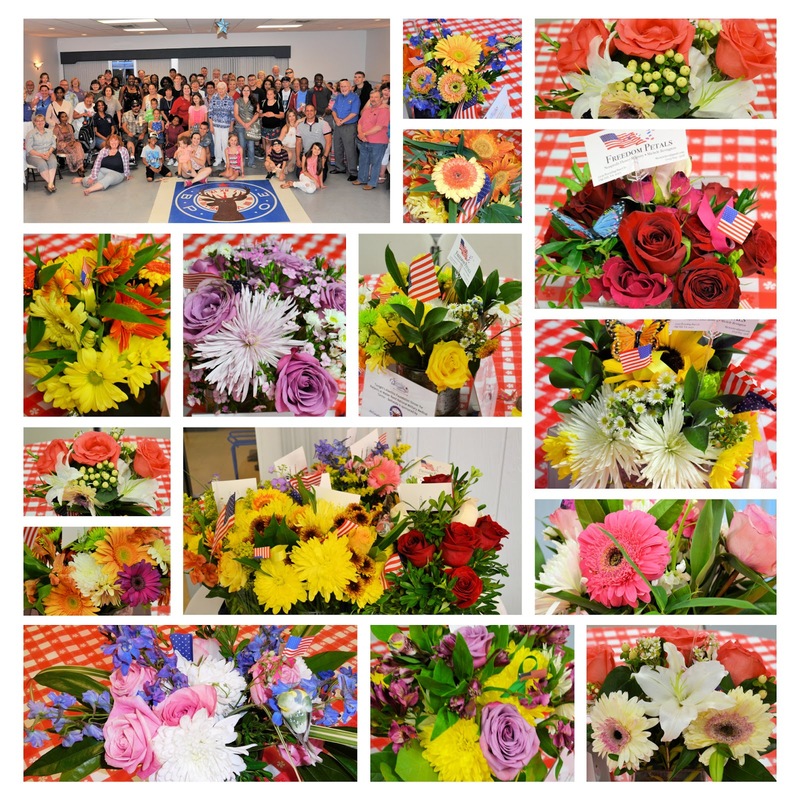 Besides all the service members and caregivers leaving the dinner with a container of flowers, several bouquets were delivered to families at the Fisher Houses on base. We learned that one of the Fisher Houses was hosting a “pancake breakfast” for Veterans on Saturday and were thrilled to receive some of the centerpieces. The “floral ballpoint pens” were delivered to the staff on the oncology wards at WRNMMC. Also, we greatly appreciate your generosity in donating the gift cards that will be included in the upcoming holiday gift bags for the wounded/injured/ill service members and caregivers. Again, thank you for touching everyone in such a joyful and unique way. We wish you, your volunteers and their families a very Blessed Thanksgiving! The Friday, August 12th Flower Event was a huge success, the 10 volunteers from the Friday team worked tirelessly to create beautiful table arrangements for the Warrior Dinner at the Elks Lodge 2188. The room was immediately transformed with our flowers welcoming over 80 attendees from our warrior families. The pot luck dinner was delicious with grilled hamburgers, hotdogs and fried chicken. The Elks members are so organized and so kind to host these dinners. Freedom petals provided the flowers and also contributed 90 cupcakes (thanks to Mary Beth, Donna, Barbara) for this event. We celebrated a wounded warrior member birthday and a 9 year wedding anniversary as well. And of course we provided special flowers to both. I have attached a special thank-you note from our Aleethia POC Margaret. 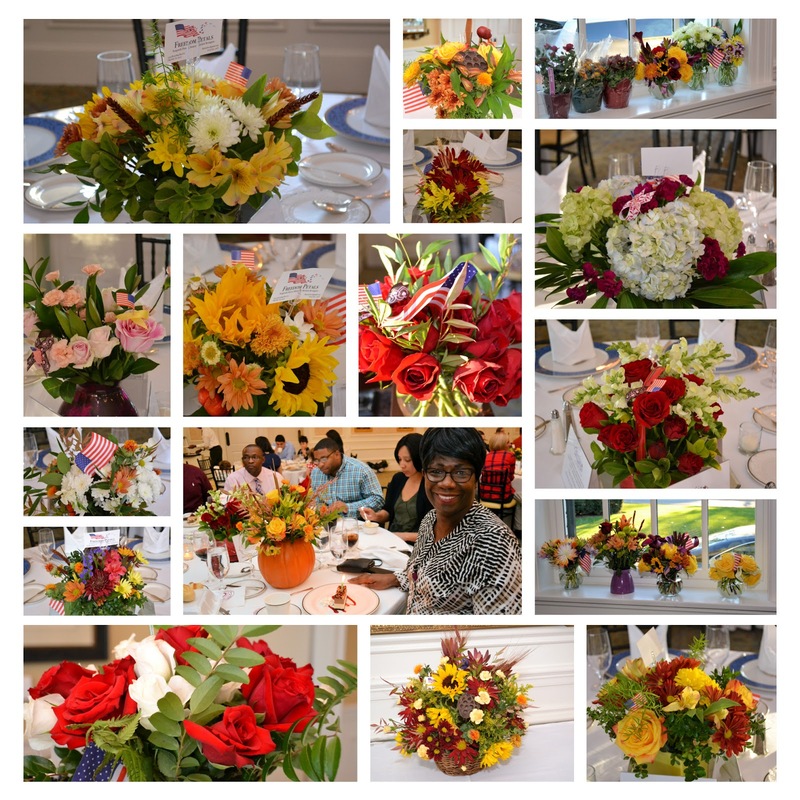 Thanks so very much to you and your band of volunteers who designed such beautiful floral arrangements for Aleethia's Friday Night Dinner being held at the Arlington-Fairfax Elks Lodge. You can't help but feel such positive energy and emotions of happiness as the wounded/injured/ill service members and their families entered the room. I believe the flowers created a room filled with sharing, laughter and healing. Again, Freedom Petals outdid themselves. We are so appreciative of Freedom Petals' partnership with Aleethia's programs. We look forward to the next time you can fill the dining room with happiness! Also, thanks for the help with the birthday cake, anniversary flowers and more. Enjoy the rest of the summer. Our June flower event was a huge success. We started at 8:30 am so we would be finished before noon. This was the first time Freedom Petals supported The Boulder Crest Retreat for wounded warriors in Bluemont, VA. Thanks so much to the volunteers who created 20 beautiful table arrangements, 6 extra vases and 3 large baskets. The mason jar flowers were all donated by Anne Harvey from The Herndon Florist in downtown Herndon. The Hoedown was a fundraising event serving lots of barbecue, hotdogs and a country band. They had 200 guests. Keith and I delivered the flowers at 2pm. The flowers were the icing on the cake and everyone was delighted with our special touches for this event. Thanks again for a successful event. The Friday, 19 February flower event was a huge success thanks to all the volunteers that came to create beautiful arrangements for the Aleethia Foundation Friday Night dinner at the WGCC in Arlington. Trader Joe's was so wonderful calling me all week with their extra valentine Roses, forced tulip vases and cut Tulip donations. We had so many beautiful roses from the Valentine weekend. Because of all the flowers that were donated by Traders I had a last minute idea...on Thursday, 18 February I called Marcelo at Fisher House on Walter Reed Base to see if I could drop off large vases of roses and buckets of colorful tulips for the Fisher House residents on Friday. So crazy right!!! On the same day as of the event and the dinner. I just didn't want to throw so many flowers away. He said great and was sending in my name for a day pass. But when I saw Marilyn (super volunteer) at the door to help that morning...another crazy idea was to have her come with me and use her military ID to get on base. Yes, she said, "YES"! She had no plans that day. So we left at noon for Walter Reed when all the work was done at my house. The Fisher House staff met us at the door and were so excited. I got home just in time to sit and put my feet up.. Next packing the truck again with the Aleethia Dinner arrangements. WHEW! 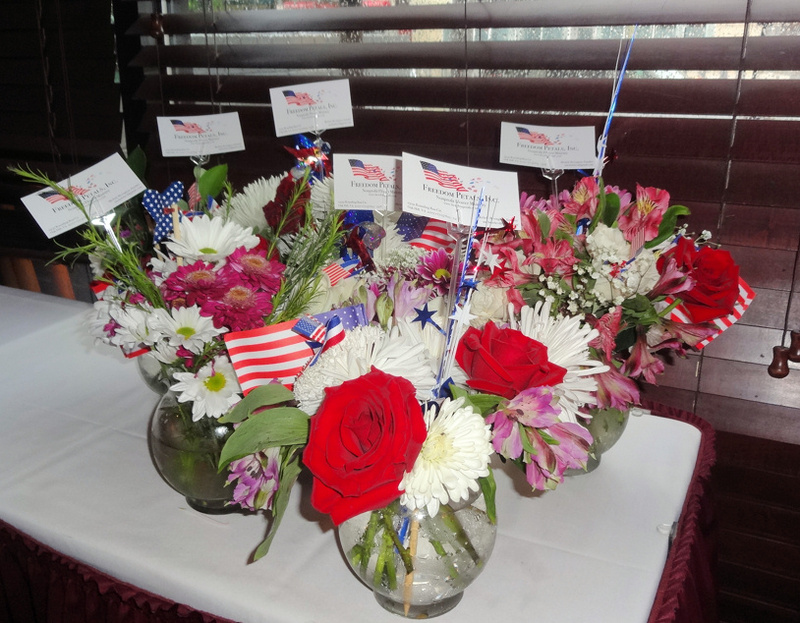 The tables at the club were shining and you could feel the smiles in the room from our beautiful bouquets. This weekend I received this email and picture collage below from Margaret (The Aleethia Foundation Queen Bee). You never really know what the impact the Freedom Petals flowers make until you get a note like this below. Spoke with the Elks Lodge organizer and they are delighted Freedom Petals will be provided St. Patrick theme florals! Their tables will have white tablecloths and napkins. 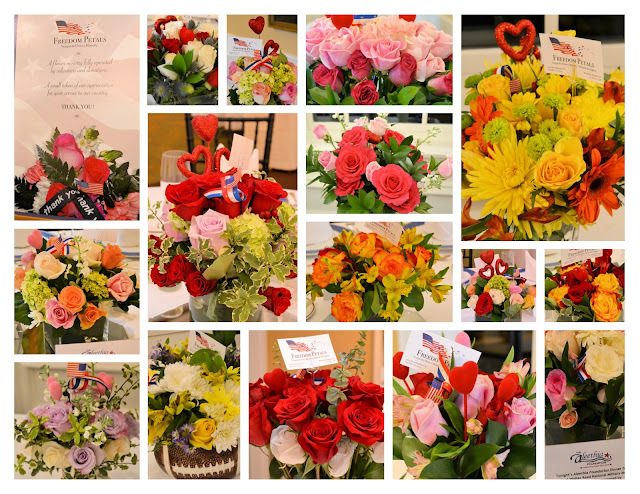 Again, thanks to Freedom Petals for the beautiful "Valentine" flower arrangements. The tables looked absolutely amazing. The glass vases with the tulip bulbs were very unique and so many folks told me how excited they are to watch their tulips bloom...All the "birthday boys" enjoyed their special arrangements. Our sponsor was delighted to see "yellow roses" in her arrangement. Seems her husband (1950 West Point grad-Korean & Vietnam Veteran) who died ten years ago on this past Thursday, would always give her "yellow roses!" The wife who got the orchid plant told me that she collects and raises orchids and was so excited to receive the plant. Her face was beaming! During the last year, she has been fighting the court system in NC in dealing with her husband's case. There were so many stories ... and the flowers brought everyone a moment of joy. 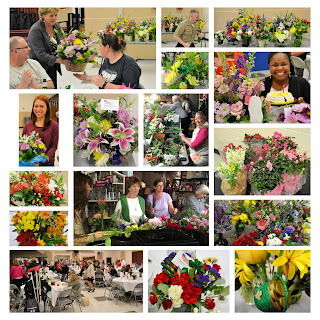 I read this quote the other day - "....flowers are the sunshine, food and medicine for the soul..." Thanks to all the wonderful Freedom Petal volunteers and donors of the flowers for bringing happiness to the wounded/injured/ill service members, their caregivers and family members who attend Aleethia's "Friday Night Dinners."